For the Arctic, it means about a 30 to 50 per cent loss in reflectivity (or albedo). And when seasonal sea-ice states are between 30 and 80 per cent below 1979 measures (depending on the method used to gauge remaining sea ice and relative time of year), that means very, very concerning additional heating impacts to an already dangerous human-caused warming. area roughly equal to the land mass of Greenland. In the past, idealized climate simulations and physical model runs had produced about a two per cent overall loss in Arctic albedo based on observed sea ice losses. This decline, though minor sounding, was enough, on its own, to add a little more than a 10 per cent amplifying feedback to the already powerful human atmospheric carbon dioxide (CO2) forcing during recent years. Such an addition was already cause for serious concern and with sea ice totals continuing to fall rapidly, speculation abounded that just this single mechanism could severely tip the scales toward a more rapid warming. But, as has been the case with a number of Arctic model simulations related to sea ice, these computer projections failed to measure up to direct observation. In this case, direct satellite observation. The situation is once more worse than expected. A new study produced by University of San Diego Scientists now shows that loss of albedo for the Arctic Ocean due to rapidly declining sea ice was four per cent during the period of 1979 to 2011. This amazing loss of reflectivity, on its own, created a powerful enough heat trap to produce an amplifying feedback to human warming equal to 25 per cent of the heat captured by CO2 emitted during that time — when spread out over the entire globe. This is a feedback double what we were led to expect from climate model simulations. Perhaps more importantly, the local feedback in the Arctic — a region containing gigatons and gigatons of additional carbon waiting to be released during a period of rapid warming — is not 25 per cent greater, but four times greater than the total human CO2 forcing since the start of the industrial revolution. It is important to step back for a moment and consider the implication of this new information. If you took all the emissions from cars in the world, all the buses, all the aircraft, all the land use CO2 emissions, all the agriculture, and all the amazing extra atmospheric heat capture that an emission equal to 160 times that of all the volcanoes on Earth would entail and added it all together, just one insult to our natural world in the form of Arctic sea-ice loss has now equaled a 25 per cent addition to that amazing total. Or just add enough extra heat equal to forty times the CO2 emitted by Earth’s volcanoes (for a total of X200). And the burden of all that extra heat is directly over a region of the world that contains a number of very large ice sheets which, if rapidly warmed, result in catastrophic land change and sea-level rise, and a number of outrageously enormous carbon deposits that, if rapidly warmed and released make the current albedo loss feedback look like child’s play. We find that the Arctic planetary albedo has decreased from 0.52 to 0.48 between 1979 and 2011, corresponding to an additional 6.4 ± 0.9 W/m2 of solar energy input into the Arctic Ocean region since 1979. Averaged over the globe, this albedo decrease corresponds to a forcing that is 25 per cent as large as that due to the change in CO2 during this period, considerably larger than expectations from models and other less direct recent estimates. It is worth noting that the period measured by the study did not include the unprecedented sea-ice area, extent and volume losses seen during 2012. So it is likely that albedo loss and related Arctic additions to human warming are somewhat worse than even this study suggests. It is also worth noting that the total additional radiative forcing from all human CO2 emissions since the industrial age began is estimated to be about 1.5 W/m2. Though seemingly innocuous, this statement is a death knell for one proposed method of geoengineering — namely cloud generation via spray ships deployed throughout the Arctic basin. The proposal had suggested that numerous ships could be spread about the Arctic during summer. These ships would be equipped with large machines that would dip into the ocean and spray sea water into the atmosphere to form clouds. The notion was that this would somehow increase albedo. Proponents of the plan neglected to provide scientific evidence that such a scheme would actually work or wouldn’t make matters worse by increasing atmospheric water vapor content — a substance with known heat-trapping properties. Despite the various hollow conjectures and reassurances, what we have seen over the past seven years or so is an extraordinarily rapid amplification of heat within the Arctic. Arctic sea ice continues its death spiral, hitting new record lows at various times at least once a year. Heat keeps funneling into the Arctic, resulting in heatwaves that bring 90 degree temperatures to Arctic Ocean shores during summer and unprecedented Alaskan melts during January. We have seen freakish fires in regions previously covered by tundra, in the Yakutia region of Russia, Alaska and Canada and in Arctic Norway during winter time. And we see periods during winter when sea ice goes through extended stretches of melt, as we did just last week in the region of Svalbard. normal, 1981 to 2010 baseline. 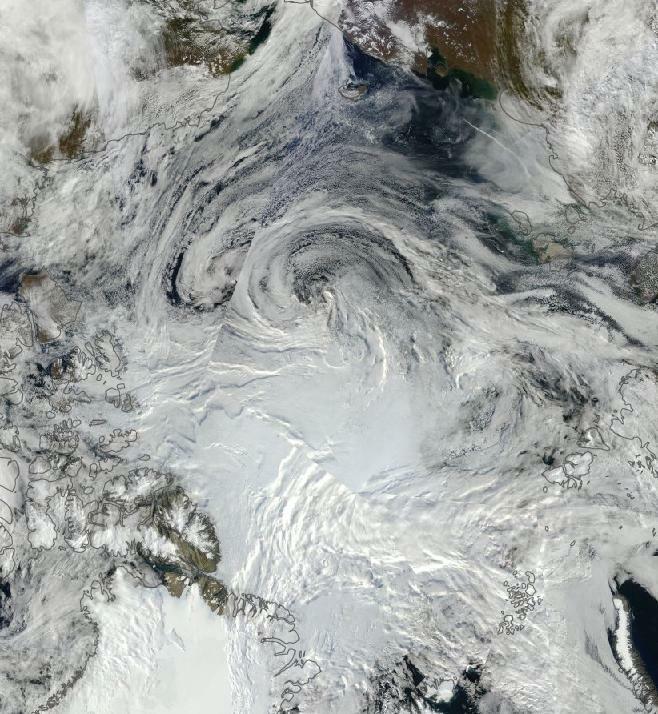 Image source: NOAA/Earth Systems Research Laboratory.